Mikrul Gauldurson is the youngest of the three brothers encountered during the Forbidden Legend quest. Together with his brothers, Jyrik and Sigdis, they conspired to murder their father in his sleep, then divide his amulet between them. Consumed by power, he and his brothers laid waste to the surrounding villages until the High King sent Archmage Geirmund leading a company of battlemages to stop them. Mikrul was run to the ground in Folgunthur, the ancient barrows at the foot of Solitude. After fighting for three days and nights, Mikrul was finally defeated. Mikrul's tomb was sealed with the Ivory Dragon Claw. 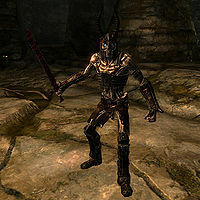 Mikrul is equipped with the Gauldur Blackblade, a leveled one handed sword with an Absorb Health enchantment on it, as well as the spells Frost Cloak and Frostbite.